Helicopter 66 is a United States Navy Sikorsky Sea King helicopter used during the late 1960s for the water recovery of astronauts during the Apollo program. It has been called "one of the most famous, or at least most iconic, helicopters in history", was the subject of a 1969 song by Manuela and was made into a die-cast model by Dinky Toys. In addition to its work in support of NASA, Helicopter 66 also transported the Shah of Iran during his 1973 visit to the aircraft carrier USS Kitty Hawk. Helicopter 66 was delivered to the U.S. Navy in 1967 and formed part of the inventory of U.S. Navy Helicopter Anti-Submarine Squadron Four for the duration of its active life. Among its pilots during this period was Donald S. Jones, who would go on to command the United States Third Fleet. Later re-numbered Helicopter 740, the aircraft crashed in the Pacific Ocean in 1975 during a training exercise. At the time of its crash, it had logged more than 3,200 hours of service. Vice Admiral Donald S. Jones was a United States Navy admiral. 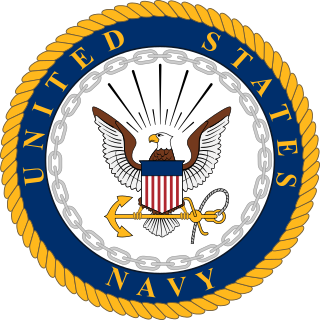 The United States Third Fleet is one of the numbered fleets in the United States Navy. 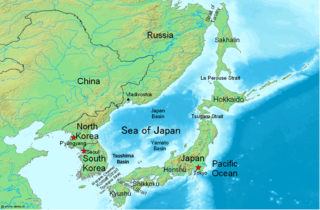 Third Fleet's area of responsibility includes approximately fifty million square miles of the eastern and northern Pacific ocean areas including the Bering Sea, Alaska, the Aleutian Islands and a sector of the Arctic. Major oil and trade sea lines of communication within this area are critically important to the economic health of the United States and friendly nations throughout the Pacific Rim region. Horsepower (hp) is a unit of measurement of power, or the rate at which work is done. There are many different standards and types of horsepower. Two common definitions being used today are the mechanical horsepower, which is about 745.7 watts, and the metric horsepower, which is approximately 735.5 watts. The Mark 46 torpedo is the backbone of the United States Navy's lightweight anti-submarine warfare torpedo inventory and is the NATO standard. These aerial torpedoes are designed to attack high-performance submarines. In 1989, an improvement program for the Mod 5 to the Mod 5A and Mod 5A(S) increased its shallow-water performance. The Mark 46 was initially developed as REsearch TORpedo Concept I, one of several weapons recommended for implementation by Project Nobska, a 1956 summer study on submarine warfare. The Sikorsky SH-3 Sea King is an American twin-engined anti-submarine warfare (ASW) helicopter designed and built by Sikorsky Aircraft. A landmark design, it was the world's first amphibious helicopter and one of the first ASW rotorcraft to use turboshaft engines. 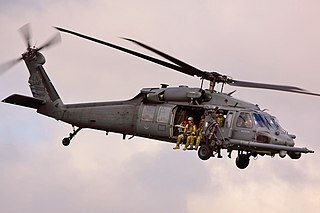 The Sikorsky SH-60/MH-60 Seahawk is a twin turboshaft engine, multi-mission United States Navy helicopter based on the United States Army UH-60 Black Hawk and a member of the Sikorsky S-70 family. The most significant modifications are the folding main rotor and a hinged tail to reduce its footprint aboard ships. USS Jarrett (FFG-33), was the twenty-fifth ship of the Oliver Hazard Perry-class guided missile frigates, was named for Vice Admiral Harry B. Jarrett (1898–1974). The Sikorsky CH-124 Sea King is a twin-engined anti-submarine warfare (ASW) helicopter designed for shipboard use by Canadian naval forces, based on the US Navy's SH-3. 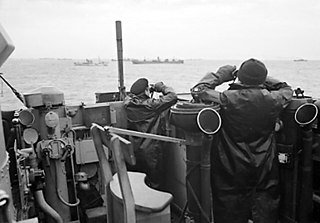 It served with the Royal Canadian Navy (RCN) and Canadian Armed Forces from 1963 to 2018. A carrier air wing is an operational naval aviation organization composed of several aircraft squadrons and detachments of various types of fixed-wing and rotary-wing aircraft. Organized, equipped and trained to conduct modern US Navy carrier air operations while embarked aboard aircraft carriers, the various squadrons in an air wing have different but complementary missions, and provide most of the striking power and electronic warfare capabilities of a carrier battle group (CVBG). While the CVBG term is still used by other nations, the CVBG in US parlance is now known as a carrier strike group (CSG). The USS Hornet Museum is a museum ship in Alameda, California, US. Sea Control Squadron 22 (VS-22) Checkmates was a carrier-based United States Navy squadron based out of Naval Air Station Jacksonville in Florida. The squadron flew the Lockheed S-3B Viking and their mission was mining, undersea and surface warfare, electronic reconnaissance and analysis, over the horizon targeting, and aerial refueling. The squadron was last attached to Carrier Air Wing Seventeen (CVW-17) and was the last squadron flying the Viking. VS-22 was disestablished in a ceremony at NAS Jacksonville on January 29, 2009, and officially on March 31, 2009. Helicopter Sea Combat Squadron Eight (HSC-8) "Eightballers" is a United States Navy helicopter squadron based at Naval Air Station North Island, San Diego, California. HSC-8 is attached to Carrier Air Wing 11 (CVW-11) and deploys aboard USS Nimitz. HSC-8 was redesignated from HS-8 on 28 September 2007. Helicopter Anti-Submarine Squadron 9 (HS-9) was the designation of two Helicopter Antisubmarine Warfare Squadrons of the United States Navy. The first squadron bearing the designation HS-9 was established on 1 June 1956 at Naval Air Station Quonset Point, Rhode Island with five HSS-1N “Seabat” helicopters. The squadron was disestablished on 1 October 1968. Eight years later, a new squadron was established on 4 June 1976, it was also designated HS-9. It deployed eight, Sikorsky SH-3H “Sea Kings”. That squadron was disestablished on 30 April 1993. Helicopter Sea Combat Squadron 25 (HSC-25) "Island Knights" is a United States Navy helicopter squadron based at Andersen Air Force Base, Guam. The "Island Knights" of HSC-25 fly the MH-60S "Knighthawk" helicopter, manufactured by Sikorsky Aircraft Corporation in Stratford, Connecticut. Helicopter Sea Combat Squadron SIX (HSC-6), is a helicopter squadron of the United States Navy. It was established as Helicopter Antisubmarine Squadron SIX (HS-6) on 1 June 1956. Its nickname is Indians. On 8 July 2011 it was redesignated Helicopter Sea Combat Squadron SIX (HSC-6). It is based at Naval Air Station North Island, is part of Carrier Air Wing 17 and deploys aboard the aircraft carrier USS Theodore Roosevelt (CVN-71). Helicopter Sea Combat Squadron 12 (HSC-12)Golden Falcons is a United States Navy helicopter squadron formerly designated HS-2, based at Naval Air Facility Atsugi, in Japan. They are attached to Carrier Air Wing Five with the aircraft carrier USS Ronald Reagan. Helicopter Sea Combat Squadron FIVE (HSC-5), also known as the Nightdippers, is a helicopter squadron of the United States Navy based at Naval Station Norfolk operating the Sikorsky MH-60S Seahawk. The Nightdippers are a part of Carrier Air Wing Seven and deploy aboard USS Harry S. Truman (CVN-75) to provide anti-surface warfare, search and rescue, vertical replenishment, Combat Search and Rescue and Naval Special Warfare Support capabilities to the carrier strike group. Helicopter Sea Combat Squadron 11 (HSC-11), also known as the Dragon Slayers, is a United States Navy helicopter squadron based at Naval Air Station Norfolk as part of Carrier Air Wing 1 operating MH-60S helicopters deployed aboard aircraft carriers. The squadron was established on 27 June 1957 at Naval Air Station Quonset Point as Helicopter Anti-Submarine Squadron 11 (HS-11) with Sikorsky HSS-1 Seabat helicopters. In 2016, HS-11 transitioned to MH-60S and re-designated as HSC-11. Helicopter Maritime Strike Squadron Seven Seven (HSM-77) "Saberhawks" is a United States Navy helicopter squadron based at Naval Air Facility, Atsugi, Japan. HSM-77 is attached to Carrier Air Wing Five and deploys aboard USS Ronald Reagan and air capable ships attached to Carrier Strike Group Five (CSG-5). The squadron was established as Helicopter Antisubmarine Squadron (Light) Forty Seven (HSL-47) on 25 September 1987 and was redesignated HSM-77 on 2 Apr 2009. Helicopter Sea Combat Squadron Nine (HSC-9) "Tridents" is a United States Navy helicopter squadron based at Naval Air Station Norfolk, Norfolk, Virginia. HSC-9 is attached to Carrier Air Wing Eight and deploys aboard USS George H.W. Bush. 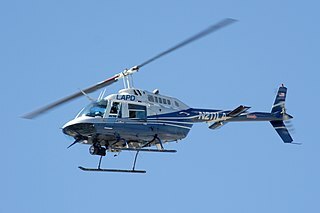 HSC-9 was redesignated from HS-3 on 1 June 2009. Helicopter Combat Support Squadron Seven (HC-7) was a helicopter squadron of the United States Navy. 1 2 "Sikorsky UH-3H Sea King". nambp.org. Naval Air Museum Barbers Point . Retrieved February 9, 2018. 1 2 3 4 5 6 7 8 9 10 11 12 13 14 15 16 17 Day, Dwayne (June 25, 2007). "The last flight of Helo 66". The Space Review . Archived from the original on February 7, 2018. Retrieved November 3, 2017. 1 2 3 4 "H-3 Sea King". fas.org. Federation of American Scientists. Archived from the original on February 7, 2018. Retrieved February 7, 2018. ↑ "S-61". Igor I. Sikorsky Historical Archives. Archived from the original on January 15, 2018. ↑ "Sikorsky UH-3H Sea King (S-61B) – USA – Navy". airliners.net . Leaf Group. Archived from the original on February 7, 2018. Retrieved February 7, 2018. 1 2 3 4 5 6 "HSC-4 Command History". HELSEACOMBATRON FOUR. U.S. Navy. Archived from the original on February 7, 2018. Retrieved February 7, 2018. 1 2 Teitel, Amy (February 10, 2018). "Why Cosmonauts Have Never Splashed Down". Discover Magazine . Archived from the original on February 7, 2018. Retrieved May 12, 2018. ↑ Putnam, Milt. "Navy Photographer Tells the Story of Apollo 11 Recovery". Naval Historical Foundation. Archived from the original on February 7, 2018. Retrieved November 3, 2017. ↑ Blair, Don (2004). Splashdown! : NASA and the Navy. Turner Publishing Company. p. 43. ISBN 978-1-56311-985-9. ↑ Carmichael, Scott (2012). Moon Men Return: USS Hornet and the Recovery of the Apollo 11 Astronauts. Naval Institute Press. pp. 121–122. ISBN 978-1-61251-252-5. ↑ "From One to Another". Vertical Magazine. April 12, 2012. Archived from the original on February 7, 2018. Retrieved November 3, 2017. ↑ Ron Nessen (July 24, 1969). NBC News (television). National Broadcasting Company. The President's applauding as they play "Columbia, the Gem of the Ocean." Columbia, of course, is the module out there ... We understand that President Nixon requested the band play "Columbia, the Gem of the Ocean". Written on the bottom of the helicopter is another welcome aboard for the astronauts, it says "Hail, Columbia". ↑ Nixon, Richard (2013). RN: The Memoirs of Richard Nixon. Simon and Schuster. p. 172. ISBN 978-1-4767-3183-4. ↑ "Helicopter 66 crash". Check-Six.com. Retrieved 14 August 2018. ↑ "Kitty Hawk II (CVA-63)". Naval History and Heritage Command. U.S. Navy. Archived from the original on February 7, 2018. Retrieved February 7, 2018. ↑ "The Final Flight". Check-Six.com. 1 2 3 4 "Aircraft Accident Report" (PDF) (Original U.S. Navy accident report uploaded by The Space Review). United States Navy aircraft mishap board. pp. 1–4. Archived from the original on February 7, 2018. Retrieved February 7, 2018– via The Space Review. 1 2 3 Day, Dwayne (September 17, 2017). "It's time to recover Helo 66". The Space Review . Archived from the original on February 7, 2018. Retrieved November 3, 2017. 1 2 "Recovery Helicopter #66". airandspace.si.edu. Smithsonian Institution . Retrieved November 3, 2017. ↑ "Manuela – Helicopter U.S. Navy 66 (song)". germancharts.com (in German). Bundesverband Musikindustrie . Retrieved February 8, 2018. ↑ "Hoe zou het zijn met Samantha?" (in Dutch). Radio 2. June 24, 2016. Retrieved February 11, 2018. ↑ "Home Muziek Radio & Televisie Musical & Theater Film Fotoalbums Kalender Wedstrijden "Goud" nieuwe album van Laura Lynn!". Front View Magazine (in Dutch). June 7, 2007. Retrieved February 11, 2018. 1 2 Lomax, Frank (June 1971). "Dinky Toys News Space Recovery Special". Meccano Magazine . p. 274. Retrieved February 7, 2018. ↑ Day, Dwayne (July 9, 2007). "Helo 66 revisited". The Space Review . Archived from the original on February 7, 2018. Retrieved November 3, 2017. ↑ "Artifact Pick of the Week". evergreenmuseum.org. Evergreen Aviation & Space Museum. Archived from the original on February 7, 2018. Retrieved February 7, 2018.